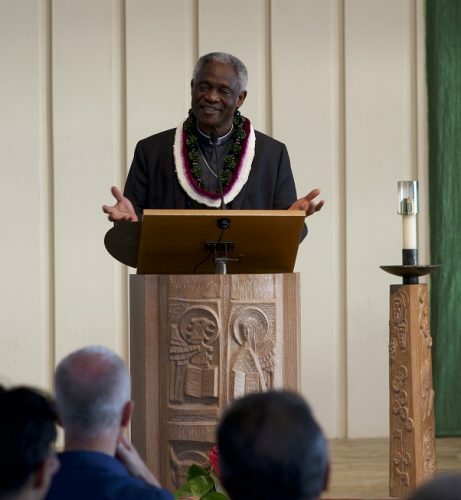 On January 15, Chaminade University was pleased to welcome Cardinal Peter Turkson at Mystical Rose Oratory as part of his larger Hawaii visit. Cardinal Peter Turkson is a top Vatican official and advisor to Pope Francis. He has been appointed by Pope Francis as the first Prefect of the new Dicastery for promoting Integral Human Development. The Cardinal spoke to Chaminade students, faculty and staff about climate change, labor and education in light of Catholic social teaching. Cardinal Turkson grew up in Ghana in West Africa. His father was a carpenter and his mother grew vegetables. From a young age, his family instilled in him a deep relationship with the environment. We are all made from the earth’s elements, teaches Cardinal Turkson. God intended us to be co-creators of this earth, but somewhere along the way with consumerism and economic growth, we have become irresponsible co-creators. Cardinal Turkson advocated for a return to a tender relationship with creation. Our concept of labor and work need to be reviewed. Labor, he said, refers to the way we exercise our talents and creativity. It is an expression of our dignity. It is through tender, peaceful, creative work that we can create transformation and truly become God’s co-creators. 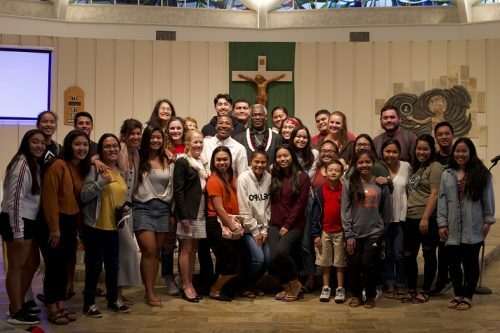 The event was live-streamed on Chaminade University’s Facebook page. To watch Cardinal Turkson’s full talk, visit facebook.com/ChaminadeUniversity.